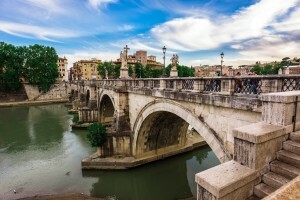 A few days ago my college friend Melissa said she was thinking about visiting Rome for the weekend. She was in the middle of a business stay in Stockholm and wanted to use a weekend to visit another city. The timing was perfect because Daniele and I had had a trip to his cousin’s in Umbria planned for this weekend, which we had to cancel last minute when Daniele’s work shifts changed. So, with our plans canceled we were exceptionally free. Also, Rome was holding an event Saturday, the “Night of the Museums” (actually it was held all through out Europe this night). Many of the city and national museums would be open until 2AM and only cost 1 Euro. Also, other places, like government buildings and embassies that are normally closed to the public were open this night, though many by appointment only, and we were too late to make any appointments. Melissa flew in Saturday evening and we met her at Termini. We had a quick dinner of Arancine (fried rice and cheese deliciousness) and then Gelato before heading out to see the sights. We ate near Lepanto, just off Cola di Rienzo, the street that connects Piazza del Popolo to the Vatican. We walked Cola di Rienzo to Piazza Popolo, then Via del Corso (Rome’s “main” street) end-to-end from Piazza Popolo to Piazza Venezia. Piazza Venezia is where the Altare della Patria stands. 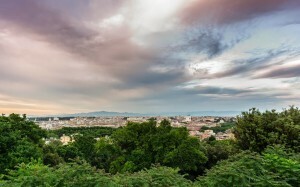 From here we bore right to Capitoline Hill (in Italian Campidoglio), home of the Capitoline Museum and Rome’s City Hall. Our goal was to enter the City Hall. The volunteers on top of the hill told us there was one line for everything: City Hall, Capitoline Museum, the ruins underneath, and a concert going as well. In the end it turned out that the City Hall was not actually open, like the website said, but we enjoyed the museum, both its collections and the two late-Renaissance palaces that they reside in: Palazzo dei Conservatori, and Palazzo Nuovo. We also, for the first time, got to see the tunnels underneath, which connect the two palaces and show off the Ancient Roman structures under ground level. 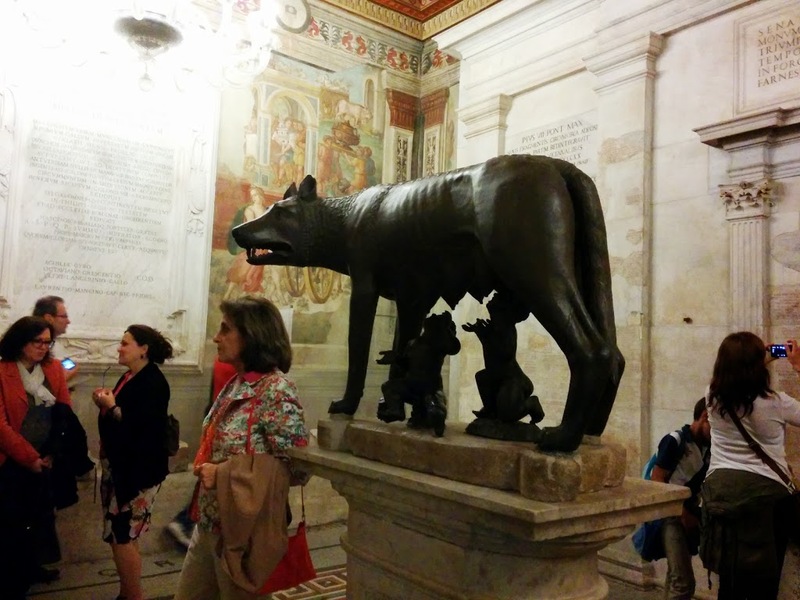 The original bronze statue of Romulus and Remus suckling their wolf mother. After we finished Capitoline, we reversed our path heading back up Via del Corso. It was getting late at this point, but we still had some time before the last places closed. We swung by the Trevi Fountain, since it is so pretty at night, before turning off past the Pantheon (closed by this hour, but we saw it from outside, at least) to Piazza Navona. Piazza Navona is possibly the most beautiful piazza in Rome. 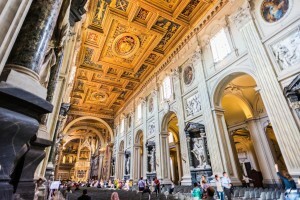 Its ovular shape is dominated by three Bernini fountains and closed in by beautiful Renaissance facades. Back in the day, before the fountains were built, the Romans would flood this piazza and stage naval battles here. Piazza Navona is also the home of the Brazilian Embassy and near the Italian Senate building, two other places that we were thinking about trying to enter tonight. They are both normally closed to the public. However, we were getting tired at this point and both had long lines out front that threatened to not finish before the last entrance. So we walked past the illuminated windows, peeking inside, before heading back to the car at Lepanto, this time taking a route along the river. Melissa was flying out at the crack of dawn on Monday– to enjoy a long layover / day-trip in Zurich, which I will admit I’m jealous of. I’ve never seen Zurich outside of the airport. That only gave us Sunday to see all the must-see spots in Rome. We started our day with the classic “cappuccino e cornetto” breakfast just outside our apartment while making our attack plan for the day. We walked to the Colosseum from our house, which is maybe a 25 minute walk, or the same time by Metro, since you have to change lines. By walking we got to pass under the Aurelian Walls before stopping at San Giovanni basilica (the “duomo” of Rome, as the Vatican is a sovereign nation in its own right). San Giovanni is very pretty and features lots of marble statues both inside and out. From here it is about another 10 minute walk to the Colosseum. At the Colosseum we were greeted by the normal large crowds mixed in with a “Race for the Cure” crowd, which at least meant the streets were closed so we could all fit. We walked past and went first to the Roman Forum, which uses the same ticket as the Colosseum but almost always has shorter lines to buy them. Here we were presently surprised to get in for free! My last AirBnb guests had left us their Roma Pass, which I figured was used up or expired, but it got us into both the Forum and Colosseum free of charge. 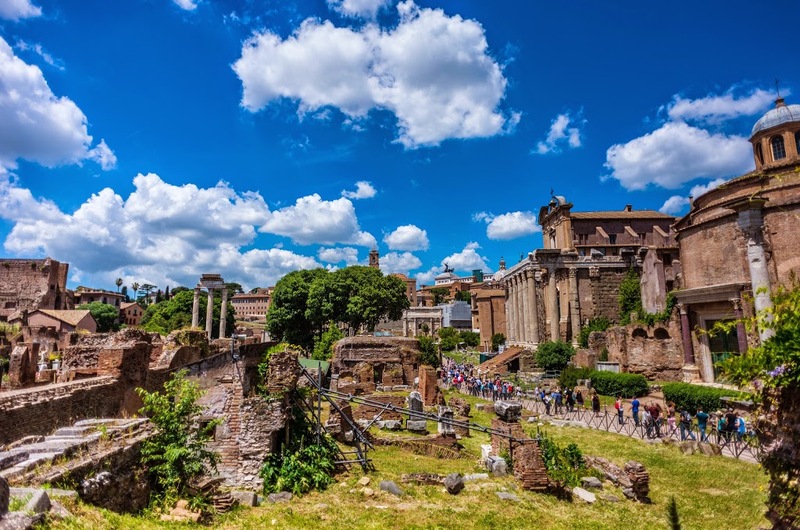 We walked around the Forum, which was the center of life and commerce in Ancient Roman times. We also crossed over to the “Palatine Hill”, where I’d never visited before. Like the Capitoline from the night before, this was one of the original Seven Hills of Rome. This one was actually were Romulus and Remus made their home. 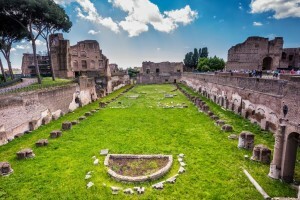 The Palatine area felt like just an extension of the Roman Forum, only a bit more open and park-like. We took the “Colosseum” exit from the Forum, then grabbed some ice cream (it was really hot) before heading into the Colosseum itself. 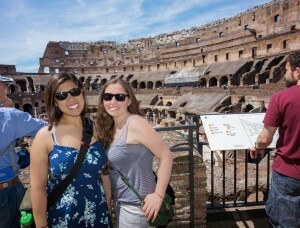 Once we finished with the Colosseum, we took the Metro from there to Ottaviano, the stop nearest the Vatican. 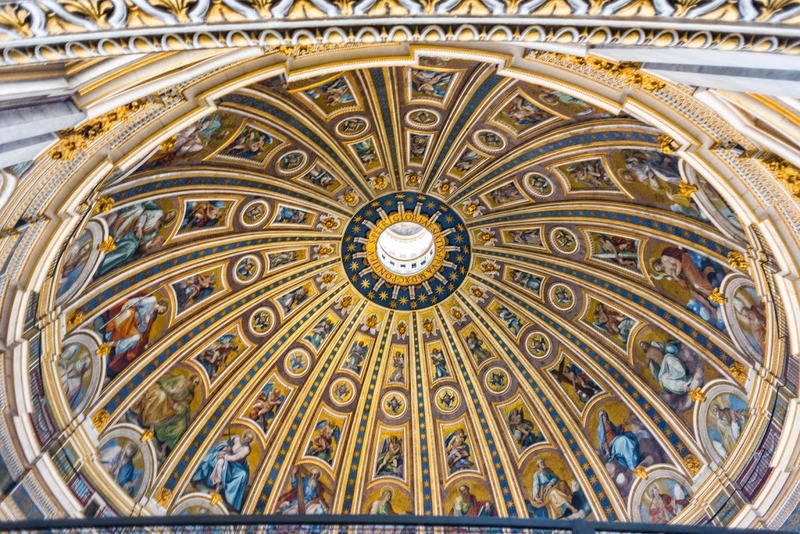 We knew we couldn’t fit in the Vatican Museum on such a short trip, but St. Peter’s is a must see. We purposely came here in the afternoon, when most of the pilgrims who came for the Sunday Blessing in the morning would have moved on to other sites. And, in fact, the line was reasonable and moved fast. We decided to spring the 5 Euros to go to the top (5 to climb all 500+ stairs, 7 to take the elevator part way then take the last 300+ stairs). I had only done this once before, with my mom and Aunt Linda, back when I first visited Rome in 2006, but I remembered that the stairs get pretty narrow. In the beginning, the stairs are wide and we could even walk side-by-side. 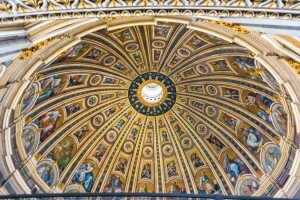 They become single-file before you arrive at an open area that is above the basilica, but not the dome yet. You then enter the dome, and walk around the inside edge of it, looking down at the HUGE church underneath. When you start climbing from this point you are actually climbing between the inside and outside walls of the dome. So the walls of the stairway are slanted, but only slightly at first, though I could see it giving anyone with vertigo or claustrophobia a bit of trouble. Then it gets a bit more narrow, and you need your hands on the walls, because there is not enough space to walk standing straight. It keeps getting more and more narrow and more and more slanted until you get to the spiral stairway that is the last section. This last part is so narrow I could not have stretched my elbows out (and I’m not particularly long-limbed). There is not even space for a central column for the spiral staircase, there is just a rope than hangs down. But finally, you come out at the very top of the dome, and have the most beautiful view of Rome, out even to the mountains beyond it. At this point it was 6PM, and the Basilica closes at 7PM. So we made our rounds inside, before walking though the piazza, and straight out the opening, in the direction of the river and Castle St. Angelo. We enjoyed the view here, of the river, the fortress, the bridge of angels, and the basilica in the distance for a few minutes before Daniele met us here. He drove us up to Gianicolo Hill where we got another nice view of Rome, now colored by the sunset. We then went to one of my favorite restaurants, MoMo, which seems fancy but has great prices and all of their food is so good. For dessert we decided on a change of venue, and picked up some canonni to-go, which we ate on the Spanish Steps. We took a quick walk up Via Condotti before heading home, tired, but having successfully captured Rome as best as I think possible in just over one day! I just want to say I am new to blogging and site-building and definitely enjoyed you’re web page. Probably I’m want to bookmark your blog post . You surely have really good article content. With thanks for sharing with us your website page. You ought to be a part of a contest for one of the finest blogs online. I will recommend this web site! Magnificent goods from you, man. I’ve understand your stuff previous to and you are just too fantastic. I really like what you have acquired here, really like what you’re saying and the way in which you say it. You make it entertaining and you still care for to keep it sensible. I cant wait to read far more from you. This is actually a great website. We simply want to inform you you the fact that I am inexperienced to wordpress blogging and really enjoyed your report. Most likely I am prone to store your web post . You definitely have superb article topic. Delight In it for telling with us your url document. What’s up, I read your blogs on a regular basis. Your writing style is awesome, keep it up! Really enjoyable elements you’ll have remarked, many thanks for adding. We simply wish to inform you in which I am raw to online blogging and genuinely valued your webpage. Likely I am most likely to store your webpage post . You seriously have stunning article writing. Value it for telling with us your url article. Exceedingly interesting points you’ll have said, warm regards for writing. We really hope to inform you which I’m just raw to posting and completely admired your write-up. Very possible I am inclined to store your post post . You definitely have amazing article posts. Acknowledge it for swapping with us your website document. Fairly compelling knowledge you have stated, thank you for putting up.